When Matt Frye took his kids to the library, he wasn't expecting to start an internet uproar. But when he saw his 7-year-old daughter looking at the cover of Girls' Life magazine, he felt he had to do something. The text framing the cover model's face promised tips for "Your Dream Hair" and "Fall Fashion You'll Love." "Quiz! Are you ready for a BF?" it asked. A few rows up sat Boys' Life magazine, with the cover: "Explore Your Future: Astronaut? Artist? Firefighter? Chef?" It featured a microscope, a satellite, a hammer. It did not offer a "denim checklist." Frye put them side by side and snapped a photo, which he posted online. "A sad microcosm of what our society says being a girl vs being a boy means," he wrote. "With three girls to raise, this breaks my heart. I'll fight like hell for my girls to not exist in this reality." He tagged his local library in Kansas City, thinking maybe the staff would rethink its magazine selection, and that would be it. That was three weeks ago. 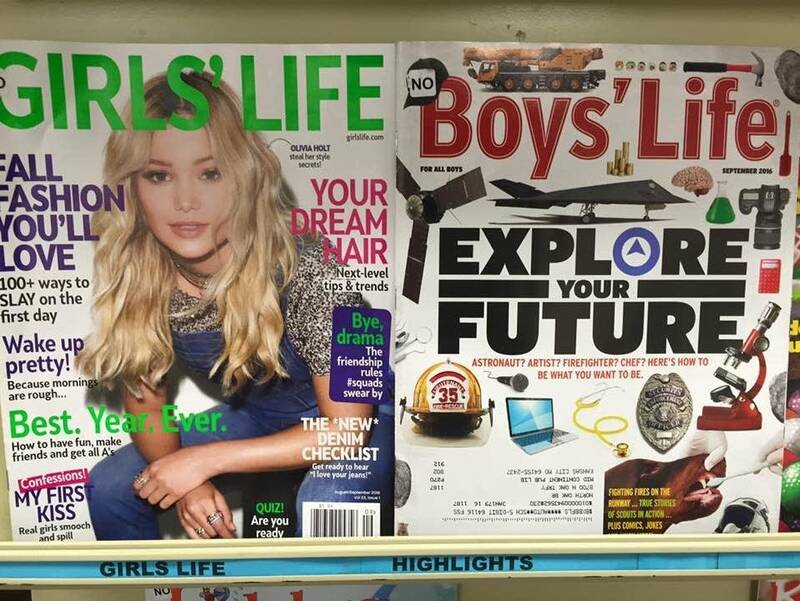 Frye's photo comparing the Girls' Life and Boys' Life covers has now been shared thousands of times, including by Amy Schumer, who simply wrote: "No." The comedian's commentary landed the photo on the Today Show, and now thousands of people around the world have joined the conversation: What kind of message does this send to girls? St. Paul graphic designer Katherine Young first saw the picture on Facebook when her friend shared it with the note: "Isn't it 2016? Isn't a woman running for president?" It seemed so sexist, she almost didn't believe it could be real. But it was. "I was also taken aback enough to do something," Young said. So she got to work. She swapped out the photo and the call-outs with her own twist, and posted it to her blog late one night. "I fixed it," she wrote. In Young's version, "Wake Up Pretty" became "Wake Up Hungry?" and "Your Dream Hair" became "Your Dream Career." The original cover model, actress Olivia Holt, was swapped out for Olivia Hallisey, the 2015 Google Science Fair grand prize winner. Young's modified cover blew up. Her blog — which she joked that not even her mom reads — went viral and the picture spread across Twitter and Facebook. "The reactions have been overwhelmingly positive and very heartwarming," Young said. "I've heard from people who are girls' advocates to the U.N., from women who are front line in the military, and even from just a dad saying, 'You know, I realize I tell my son I'm proud of him and his accomplishments, and I always tell my daughter she's pretty. I have to be mindful to tell her: Wow, you did a great on this test. Wow, you did great kicking that goal.'" "Just knowing that there are people out there that kind of got a wake-up call from this was pretty amazing," she said. Young isn't advocating for people not to buy Girls' Life — the problem is bigger than just one cover or just one magazine. The beauty-first message follows every modern teenage girl everywhere she goes, from the movie theater to the grocery store. "There are girls out there who will never see themselves ... in the media," she said. "No matter what science fair they win, no matter what solo they sing, they will still judge themselves on what stores carry their jeans size or if a magazine cover looks like them." Young grew up devouring girls' magazines that offered the same promises as the Girls' Life cover. "I loved them. I went through them and picked out the lipstick shade I needed to get next, and always looked at the fashion tips — and all the fashion tips never fit my body type." Magazines today, she said, can and should do better. Girls' Life, which was founded in 1994, is aimed at girls age 10 to 16. "Parents can trust GL to guide their girls through the growing-up years — without making them grow up too fast," the magazine promises. Despite the similar name, it is not affiliated with Boys' Life, which is the official magazine of the Boy Scouts of America. 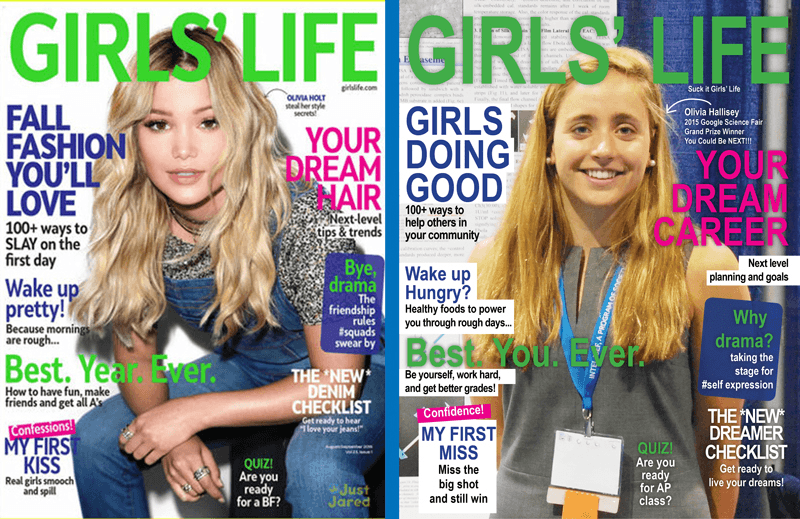 Girls' Life is a for-profit publication. And behind its much-dissected August cover, there are tips on making good decisions and doing your best in school. Articles on the magazine's website offer advice on what to do if your friend comes out to you and how to start prepping for college, alongside hair dye tips and an answer to "Can I shave my tummy hair?" "I'm really proud of the 'Wake Up Pretty' article," said Karen Bokram, the publisher and founding editor of Girls' Life. "It's about healthy sleep habits. We all know teenagers don't get enough sleep." Bokram has found her magazine sucked into a maelstrom of internet outrage this month, and she encourages people to read it before they criticize. "Teenage girls have a lot of different interests," she said. The magazine tries to incorporate all of them, and that means advice on hair straighteners and eyeliner alongside fall book recommendations. Girls' Life isn't the only publication this year to ignite a debate on messaging for young girls. This spring, Discovery Girls, which has a younger audience, published a spread on: "What Swimsuit Best Suits You?" Critics slammed them for encouraging girls as young as 8 to worry about their curves. For Young, the overwhelming response to her modified Girls' Life cover shows that people are ready for change. She wants to see the conversation push beyond magazines. "Even more important than that magazine on that shelf is just being positive influences in a girl's life," she said. "Watch the messages you're sending to girls and boys — I think that is more impactful than anything they pick up on the shelf."